Opener, ‘Ray Gun’ hits quickly and hard with its catchy old school sound tinged with elements of indie rock, with gritty angsty vocals and rebellious instruments, all presented and arranged in an effective and memorable flash! 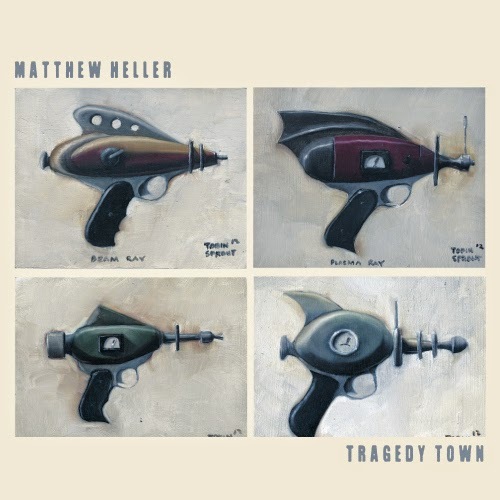 Title song, ‘Tragedy Town’ opens on muddy guitars with a bleak feel, aided by the slow and clean vocals presented using interesting rhythms, melodies and chord structures - ‘tragedy’ will stick with you even with its short presence! ‘No Army’ has a brilliant country acoustic intro and shows off the most diversity with folk inspired instruments mixing acoustic and electric guitars to create a wonderful fast paced folk concoction, with its use of string instruments adding more depth and layers to the many explorations of Matthew’s sounds! He may not have an ‘army’ but with highly melodic unusual songs like this he sure will gain a following! Closing song, ‘Fault Line’ is a piano driven tune and shows off one more of Matthew’s many talents in the slowest and most delicate song featured, exhibiting more passion and soul than previously. Ending the EP on a slower number rounds things up nicely and makes you reflect on the different styles we have been graced with and demonstrates even when toned down he can create very catchy melodies. Matthew does what many singer-songwriter’s fail to do, by giving us so many different sounds and showing what he is really made of by exploring and being innovative, making his sound very unique to him which is something that is extremely hard to pull off, and for that reason you should definitely give this EP a listen to discover something different and appreciate strong musicianship! MAMMOTHFEST METAL TV SHOW LAUNCHED!